(Nanowerk News) A team of scientists at Virginia Commonwealth University has synthesized a powerful new magnetic material that could reduce the dependence of the United States and other nations on rare earth elements produced by China. "The discovery opens the pathway to systematically improving the new material to outperform the current permanent magnets," said Shiv Khanna, Ph.D., a commonwealth professor in the Department of Physics in the College of Humanities and Sciences. 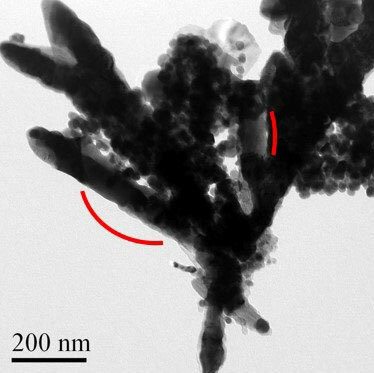 A transmission electron microscope image of the newly synthesized CoFe2C rods that contain an assembly of nanoparticles. The new material consists of nanoparticles containing iron, cobalt and carbon atoms with a magnetic domain size of roughly 5 nanometers. It can store information up to 790 kelvins with thermal and time-stable, long-range magnetic order, which could have a potential impact for data storage application. When collected in powders, the material exhibits magnetic properties that rival those of permanent magnets that generally contain rare earth elements. The need to generate powerful magnets without rare earth elements is a strategic national problem as nearly 70 to 80 percent of the current rare earth materials are produced in China. The team's findings will appear in the article "Experimental evidence for the formation of CoFe2C phase with colossal magnetocrystalline-anisotropy", in a forthcoming issue of Applied Physics Letters. Permanent magnets, specifically those containing rare earth metals, are an important component used by the electronics, communications and automobile industries, as well as in radars and other applications. Additionally, the emergence of green technology markets - such as hybrid and electric vehicles, direct drive wind turbine power systems and energy storage systems - have created an increased demand for permanent magnets. However, China is the main supplier of world rare earth demands and has tried to impose restrictions on their export, creating an international problem. The current paper is a joint experimental theoretical effort in which the new material was synthesized, characterized and showed improved characteristics following the theoretical prediction. "This is good science along with addressing a problem with national importance," said Ahmed El-Gendy, a former postdoctoral associate in the Department of Chemistry in the College of Humanities and Sciences and a co-author of the paper. Everett Carpenter, Ph.D., a professor in the Department of Chemistry and director of the VCU's Nanoscience and Nanotechnology Program, said the new material is "already showing promise, even for applications beyond permanent magnets."